Bonding in coordination chemistry has been explained via many theories. In order to illustration diverse properties exhibited via complexes, such theories were modified. The theory of Effective Atomic Number (EAN) rule was 1st utilized but originate to be inadequate as behaviour of many complexes couldn't be described via such techniques. The EAN rule states that stable compound should have electronic configuration of its nearest noble gas. There are many exceptions to this rule since it limits the coordination number possible for each metal. Octahedral compounds of many compounds illustrate exception to this theory. Though, the theory is adequate sufficient to explicate the bonding in metal complexes with metal in zero oxidation state. Instances are [Ni(CO)4] and [Cr(CO)6] where the central metal has zero oxidation number and accommodates ligands sufficient enough to have the electronic configuration of their nearest noble gas. The theory can't describe the reason for variation in coordination number, therefore the need for another theory. Valence bond theory (VBT) is introduced to illustrate the reason for the variation in coordination number depends on the number of hybridized orbitals of the metal employed in bonding. It cannot explain fully the concept of colour and magnetic properties of complexes. Crystal Field Theory (CFT) is used to provide explanation for the spectra and magnetic properties of complexes. Even though, CFT is extremely helpful, it can't explain some degree of covalence in some complexes. To be able to explain reason for some degree of covalence in some complexes, the CFT is modified to adjusted crystal Field theory (ACFT) as well said Ligand Field theory (LFT). Finally, Molecular Orbital theory (MOT) is introduced to fully explain the diverse properties of complexes. To have indebt understanding of bonding in complexes these theories must be fully studied. i. Dissociation of the salt to make the cation (M+) available for coordination. Hybridization of atomic orbitals of the cation needed to accommodate the electron pairs to be donated. iii. Rearrangement of electrons in the cation atomic orbitals, where essential to ensure that the hybridized orbitals are free to accommodate the donated electron pairs. iv. Bond formation between the cation and the ligands via overlapping of atomic orbitals of ligands containing the lone pair and the hybridized orbitals of the cation. v. Spatial orientation of the ligands to minimize repulsion between them leading to stereochemistry (shape) of the complex Stereochemistry in complexes depends on the kind and number (coordination number) of atomic orbitals of the central metal atom or ion hybridized. 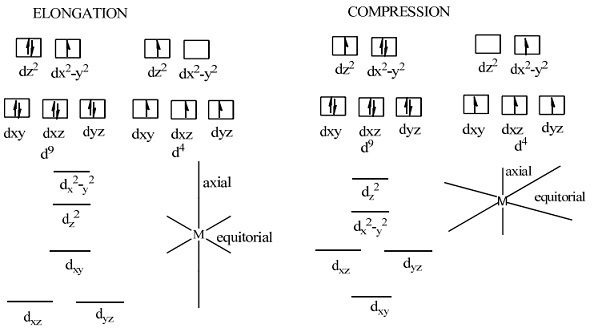 Below is a table illustrating possible structures for different coordination number and hybridization. The coloured arrows indicate the spins of the electrons of the donated pairs while the dark arrows represent the spins of the metal. Generally, tetrahedral complexes are high spin complexes while square planar complexes are low spin complexes. The number of unpaired electrons computations the magnitude of the magnetic properties of the complexes. Complexes with no unpaired electron are diamagnetic while those through unpaired electrons are paramagnetic in nature. In [Ni(CN)4]2-, the two unpaired electron in the Ni2+d orbitals are forced to pair up due to approach of strong CN- ligand unlike Cl- that has less repulsion effect on the unpaired electrons in [Ni(Cl)4]2- complex. As we know that 2 electrons in Mn2+ are forced to pair up in [Mn(NO2)6]3- due to approach of the strong ligand (NO2-) while in the hexaaqua complex of Mn3+, such electrons continued unpaired. There are several traits of coordination complexes that aren't satisfactorily described via VBT explanation of the bonding. For instance, the magnetic moment of [CoF6]3-illustrates that there are four unpaired electrons in the complex, whereas that of [Co(NH3)6]3-illustrates that this complex has zero unpaired electrons, even though in the two complexes Co3+ is a d6 ion. In VBT, the bonding types in these complexes are shown to involve sp3d2 and d2sp3hybrid orbitals respectively, but that doesn't provide an explanation as to why the two cases exist. Another aspect that is inadequately explained by VBT approach is the number and type of absorption bands observed in the spectra of complexes. One of the most successful approaches to explaining such characteristics is recognized as crystal field theory. When a metal ion is surrounded via anions in a crystal, there is an electrostatic force (field) generated via the anions, which changes the energies of the d orbitals of the metal centre. The field generated is recognized as a crystal field. Crystal field theory was introduced in the year 1929 by Hans Bethe to explain the spectral characteristics of metal complexes. This is a purely electrostatic model that assumes electrostatic interaction between positively charged metal centre and negatively charged anions or polar molecules. Unlike VBT, CFT predicts properties of complexes depend on repulsion between electrons of the metal and those of the ligands in a complex. The positive charge on the metal is assumed to be the source of attraction for the ligands however; the ligands are as well repelled through the d-orbital electrons of the metal. The repulsion on the d-orbital electrons isn't consistent leading to splitting of the d-orbitals. The splitting of the orbitals consequences in loss of degeneracy among the 5 d-orbitals. The pattern of splitting is dependent on the coordination number and stereochemistry of the complex. CFT approach considers the metal as positive point charge and the ligands as negative point charges. The ligands move towards the centre of the metal in the direction of the coordinates related to the shape to be accepted via the metal. 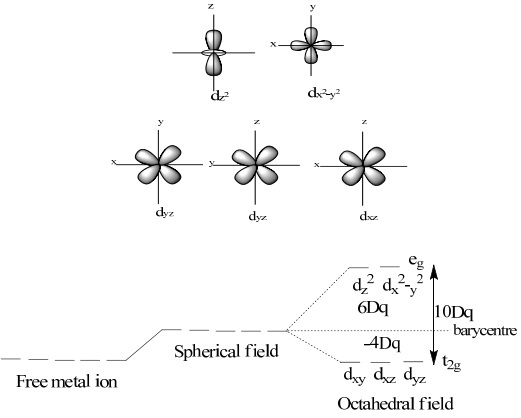 Before the resultant effect of the field around a metal centre generated by the ligands can be illustrated, it is important to have an understanding of the shapes and orientations of the d orbitals of the metal. The set of 5 d-orbitals are shown below. In free gaseous metal ion, the 5 orbitals are degenerate (of equal energy). The 5 orbitals remain degenerate in a spherical electrostatic field with a higher energy since all will be equally raised by the same amount. An octahedral complex can be considered as a metal ion approached by six ligands along the x, y and z axes. When six ligands surround the metal ion, the degeneracy of the d orbitals is lost because three of the orbitals; dxy, dyz and dxz orbitals, are directed between the axes while the others, dx2-y2 and dz2, are directed along the axes pointing at the ligands. Consequently, there is greater repulsion between the electrons in orbitals on the ligands and the dx2-y2 and the dz2 orbitals than there is toward the dxy, dyz and dxz orbitals. Since of the electrostatic field produced via the ligands, all of the d orbitals are raised in energy, but two of them are raised more than the other three. The two orbitals of higher energy are allocated as the for instance orbitals, and the three orbitals of lower energy make up the t2g orbitals. The 'g' subscript implies being symmetrical through respect to a centre that is present in a structure that has octahedral symmetry. The "t" terms to a triply degenerate set of orbitals, whereas "e" terms to a set that is doubly degenerate. The energy separating the two groups of orbitals are said the crystal splitting, Δ0. Splitting of the energies of the d orbitals occurs in such a way that the overall energy continues unchanged and the "center of energy" (barycentre) is maintained. For instance orbitals are raised 1.5 times as much as the t2g orbitals are lowered from the center of energy. Even though the splitting of the d orbitals in an octahedral field is symbolized as Δo, it is as well sometimes symbolized as 10 Dq, where Dq is an energy unit for a particular complex. The two orbitals of the for example, are raised via 3/5Δo or 6Dq while the t2g orbitals are lowered by 2/5Δo or 4dq relative to barycentre. The crystals splitting (Δo) computes the energy needed for an electron to be promoted from the lower energy level or orbital to the higher energy level. Δo depends on the nature of the Ligand the stronger higher the electrostatic force produced via the approach of the ligand the greater Δo. For electron to be promoted to a higher energy level, it must absorb light energy with wavelength equivalent to Δo. The effect of crystal field splitting is easily observed by studying the absorption spectrum of [Ti(H2O)6]3+ since Ti3+ ion has 3d1 outer electronic configuration. In the octahedral field generated by the six H2O, the 3d orbitals split in energy. The only transition possible is promotion of the electron from an orbital in the t2g set to one in the for instance set. This transition shows a single absorption band, the maximum of which corresponds directly to the energy represented as Δo. As expected, the spectrum illustrates a single, broad band that is centred at 20,300 cm-1. This energy (243 kJmol-1) is large enough to cause other consequence when a metal ion is surrounded by six ligands. Though, only for a single electron system is the interpretation of the spectrum easy. With multiple electrons in the d-orbitals, the electrons interact via spin-orbit coupling leading to complication in the interpretation of the spectra. If several complexes of the same metal ion and the same coordination number are prepared using different ligands, the positions of the absorption bands will be shifted to higher or lower wave numbers depending on the nature of the ligand. In this manner, it is possible to arrange ligands according to their ligand field splitting capacity. The series of ligands arranged this way is said as the spectrochemical series of the ligands. Differences between the splitting generated via adjacent members in the series are small, and the order is approximate in several cases ([Fe(H2O)6]3+ =14, 000 cm-1 and in [Fe(ox)3]3- = 14, 140 cm-1), especially when different metal ions or metal ions in different rows of the periodic table are considered. For instance, the order of the halide ions is changed if the metal ion is from the second transition series. The spectrochemical series is a extremely helpful guide since reversals between rather extensively divided members these as NO2- and NH3 don't occur. Ligands that force electron pairing are recognized as strong field ligands, and such ligands can be expected to provide low-spin octahedral complexes through first-row metal ions. Weak field ligands are known to provide high-spin octahedral complexes through first-row metal ions. Jahn Teller theory states that any non linear molecular system in a degenerate electronic state will be unstable and will undergo several sort of geometrical distortions to lower its symmetry and eliminate the degeneracy. Distortion is inevitable if there is unsymmetrical profession of degenerate orbitals. Metal ions by d9(Cu2+) and d4 (Cr2+) high spin in octahedral field are known to have distorted octahedral shapes due to unequal number of electrons occupying the eg orbitals. With nine electrons, the 2 orbitals of eg can't contain the equivalent number of electrons, there will be 2 electrons in one orbital and one electron in the other. The orbital through two electrons will have greater repulsion for ligands on its axis compare to the orbital by one electron. Consequently, all the ligand-metal bond length won't be equal therefore distortion happens in the complex. If the orbital by the greater number of electron is dz2, the ligands along the z-axis won't be as close to the metal centre as others. The ligands in dz2direction will have longer ligand-metal bond length. These consequences in elongation distortion. If the dx2-y2 encloses greater number of electron compare to dz2 in an octahedral field, the ligands along the x and y plane will experience greater repulsion leading to enhance in length of the ligands along the equatorial region. The d9 configuration isn't the only one for that distortion leads to a lower energy. The d4 high-spin configuration will have one electron in every of the four lowest-lying orbitals with an energy that is lower as an effect of splitting the dx2-y2 and dz2 orbitals. The Cr2+ ion has d4configuration, distortion is expected to take place for complexes of this ion, and this is certainly the case. Similarly, a distortion would be predicted for a d1 or d2 ion, for which the electrons would be located in the two orbitals of lowest energy. Though, the magnitude of splitting in t2g is much smaller than that of eg because the orbitals included are directed between the axes, not at the ligands. Such are nonbonding orbitals, so the effect of moving the ligands on the z axis farther from the metal ion is much smaller. The result is that any distortion involving metals through such configurations is incredibly small. This kind of distortion is said compression. Distortion is as well possible in tetrahedral complexes but not as pronounced as in octahedral complexes. It is significant to note that not all complexes are octahedral or even have six ligands linked to the metal ion. Thus there is required to study behaviour of other possible crystal fields. Many complexes are known to have tetrahedral symmetry hence, the need to determine the effect of a tetrahedral field on the d orbitals. In a tetrahedral field, none of the metal's d orbitals point exactly in the direction of the ligands rather they are in between the ligands in the crystal field. However, the triply generate orbitals (dxy, dyz and dxz) are closer to the ligands' path on approaching the metal centre than the doubly generate orbitals (dx2-y2 and dz2) The result is that the dxy, dyz and dxz orbitals are higher in energy than are the dx2-y2 and dz2 orbitals as of the difference in how close they are to the ligands. In a easy language, the splitting pattern generated via a tetrahedral field is an inversion of an octahedral field's splitting pattern. The magnitude of the splitting in a tetrahedral field is designated as Δt. There are differences between the splitting in octahedral and tetrahedral fields. The two sets of orbitals are inverted in energy and the splitting in the tetrahedral field is much smaller than that generated via an octahedral field. Reasons; there are only 4 ligands producing the field rather than the six ligands in the octahedral complex, none of the d orbitals point directly at the ligands in the tetrahedral field and in an octahedral complex, two of the orbitals point directly toward the ligands and three point between them. This effect in a maximum energy splitting of the d orbitals in an octahedral field. In fact, it can be shown that if identical ligands are present in the complexes and the metal-to-ligand distances are related, Δt = (4/9) Δo. This difference in energy value describe the reason why tetrahedral complexes are rare or simply put don't exist as the splitting of the d orbitals is not large enough to force electron pairing. As well, because there are only four ligands surrounding the metal ion in a tetrahedral field, the energy of all of the d orbitals is raised less than they are in an octahedral complex. No symmetry symbol is required to describe the bond in tetrahedral field because there is no centre of symmetry in a tetrahedral structure. A square planar arrangement of ligands can be obtained from octahedral model by removal of the two ligands point directly along the z axis. This will result in decrease in repulsion experienced along the z-axis and orbitals with z component will experience decrease in energy and greater stability. The energy of dz2, dxz and dyz will be reduced while those of dx2-y2 and dxy will increase. The orbital arrangement in square planar complex is shown below. Metal ions with d8 (Ni2+, Pt2+ and Pd2+) configuration are known to form square planar complexes which are diamagnetic in nature resulting from relatively large difference in energy of dxy and dx2-y2 forcing the electrons to pair in orbital of lower energy level. i. The nature of the ligands- the smaller the size of the anions the greater the splitting. This can be observed with the halides F- > Cl- > Br- > I-. Similarly, ligands with ability to form π-bond cause greater splitting. Co > CN- > phen > NO2-. ii. The higher the oxidation state or the primary valence of the metal the greater the splitting. Generally, M3+ ions cause greater splitting than M2+ ions. Even though crystal field theory gives insight to spectra and magnetic properties of complexes through the idea of strong and weak field ligands, it can't account for the position of such ligands on the spectrochemical series and it can't as well described the reason why several degree of covalency is examined in a number of complexes. The crystal field theory is modified to obtain into account the existence of several degree of covalence in evolution complexes depend on the evidence from electron spin resonance spectra that illustrates that indeed percentage of the electrons is diffused into the ligand orbital. Consequently, the bond existing in complexes isn't purely electrostatic. The modification of CFT results into Ajusted Crystal Field Theory as well said Ligand Field theory (LFT). If the degree of diffusion or overlap is in excess, the LFT won't hold rather a pure covalent treatment will be suitable hence the use of Molecular Orbital theory (MOT). The LFT can be considered as a mid-point between electrostatic and covalent description of bonding in metal complexes. The LFT is purely a parameter depend model involving the employs of experimentally derived data or parameters as Crystal field stabilization energy, Racah parameters that are derived from electronic spectra of complexes. Molecular Orbital Theory is the result of overlap of bonding atomic orbital of the ligands and the hybridized orbital of the metal leading to formation of both bonding and antibonding molecular orbitals. In a molecular bonding scheme, the numbers of bonding and antibonding orbitals are equal but the antibonding orbitals canceled out the resultant effect of the bonding orbitals. Molecular Orbital Theory in an octahedral complex can be illustrated with complex [Co(NH3)6]3+ in which metal-ligand σ-bonding is dominant. In the construction of a molecular orbital energy level diagram for such a complex, many approximations are made and the outcome is considered to be qualitatively accurate. Despite this, the results provide useful explanation on metal-ligand bonding. Cr3+ is a first row metal, the valence shell atomic orbitals are 3d, 4s and 4p. In octahedral symmetry the s orbital has a1g symmetry, the p orbitals are degenerate with t1u symmetry, and the d orbitals split into two sets with for instance (dz2 and dx2-y2) and t2g (dxy, dyz and dxz) symmetries. Each ligand, NH3, provides one orbital. Six orbitals from the ligands are assigned a1g, t1u and eg symmetries. The nine valence orbitals of the metal are grouped into bonding and non-bonding orbitals the bonding orbitals are; 4s, 3px, 3py, 3pz, dx2-y2 and dz2 which are in the direction of the approaching hence suitable for overlapping. The t2g set (dxy, dxz, dyz) which are not exactly in the direction of the approaching ligands are considered non-bonding. The diagram below shows the Molecular orbital arrangement for the complex [Co(NH3)6]3+. The six ligand orbitals and six orbitals of the metal are grouped into six bonding molecular orbitals and six antibonding molecular orbitals, while t2g orbitals are left as nonbonding molecular orbitals. Electrons from the ligands are filled into the bonding orbitals while the d electron are filled into nonbonding t2g orbitals and Lowest unoccupied Molecular Orbital (LUMO) which are the antibonding orbitals representing the eg set of the metal d orbitals. A metal ion surrounded by ligands in a complex will experience changes in the total electron environment of the metal ion when compare to the atmosphere in the uncomplexed metal ion due to the coordinated ligands. One consequence is that the energy required to pair up electron will be altered. Even though the energy essential to pair up electron in free metal ion can be easily estimated from the suitable spectroscopic data, this isn't applicable to a metal ion that is contained in a complex. When ligands bind to a metal ion, the orbitals on the metal ion are spread out over a larger region of space and enlarge to the orbitals of the ligand. In molecular orbital terminology, the d-orbital electrons of the metal ion become more delocalized in the complex than they are in the free ion. This expansion of the electron cloud is said the nephelauxetic effect. As a effect of the nephelauxetic effect, the energy needed to pair up electrons in the metal ion is somewhat smaller than it is for the free ion. When ligands these as CN-, CO and NO2- are present, the nephelauxetic effect is fairly huge owing to the ability of the ligands to π bond to the metal as a result of back donation. Using an advanced developed tutoring system providing little or no wait time, the students are connected on-demand with an expert at www.tutorsglobe.com. Students work one-on-one, in real-time with a tutor, communicating and studying using a virtual whiteboard technology. Scientific and mathematical notation, symbols, geometric figures, graphing and freehand drawing can be rendered quickly and easily in the advanced whiteboard.